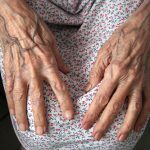 For years, a crisis has been brewing in the nursing home industry where certified nursing assistants have received low wages and poor/no benefits while providing care to their residents. Many of these nursing assistant jobs require the employee to work erratic hourly schedules for poor benefits, little pay, and usually no opportunity to advance in their career. These jobs have been associated with high injury rates and high turnover. Approximately 50% of all nursing assistants in the United States live well below the federal poverty level. Low pay often results in the need to work longer hours, which could cause fatigue and place the resident’s health in danger. The problem with underpaying and understaffing is likely to increase significantly in the years ahead, as the last of the baby boomers enter their retirement years, and the need for additional nursing home beds rises. According to the US Bureau of Labor, the number of nursing home workers across America has doubled over the last decade with many more jobs likely available by 2024. Statistics show that the population of Americans over 85 years old will likely be doubled by 2030 where most will require some level of professional skilled nursing care at a facility or in their home. The Illinois Department of Public Health (IDPH) conducts regular investigations, surveys and inspections of Nursing Facilities, Assisted Living Homes and Rehabilitation Centers statewide throughout the year. The efforts of the surveyors and inspectors can quickly identify any violation of regulations as outlined by the Nursing Home Care Act. When surveyors identify a deficiency or violation, state and federal nursing home regulators can take quick action to impose severe penalties in monetary fines. The Illinois Department of Public Health (IDPH) conduct routine inspections, investigations, and surveys of all nursing homes, rehabilitation centers, and assisted-living facilities throughout the year across the state. 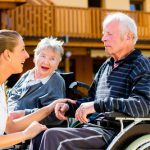 The inspectors typically arrive at the facility unannounced to determine the level of care every resident is being provided and identify any violation of regulations as outlined by the Nursing Home Care Act. When surveyors find a deficiency or violation, federal and state nursing home regulators usually take quick action to enforce regulations and impose severe penalties in monetary fines. 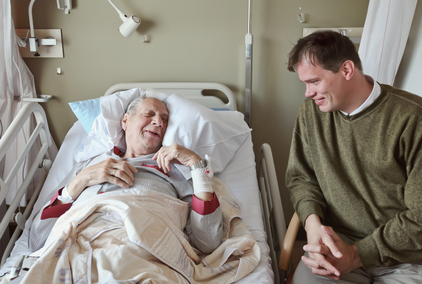 The dedicated nursing home neglect attorneys at Rosenfeld Injury Lawyers LLC remains committed to posting publicly available information so families can make a fully decision about where to place a loved one who requires the highest level of skilled nursing care. If you suspect that your loved one was abused, mistreated or neglected in an Illinois nursing home, we encourage you to contact us today to schedule a free, initial consultation with our experienced attorneys to discuss your legal options and rights. We provide every client a “No Win/No-Fee” Guarantee, meaning you pay us only when, and if, our law firm is successful in resolving your case. Rockford, Illinois – The quarterly report released by the IDPH (Illinois Department of Public Health) in the fall of 2017 revealed that Forest City Rehab & Nursing Center was cited for multiple violations. The nursing facility is located at 321 Arnold Ave. in Rockford. The report revealed that the facility was fined $29,400 for one Type A violations and two Type B violations. Type A and AA violations are the most serious violations that could or did result in a resident’s death. The Illinois Department of Public Health (IDPH) performs routine investigations and surveys on nursing facilities throughout the state. 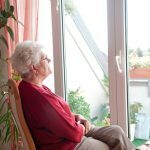 Their efforts help to identify any nursing facility, Rehabilitation Center or Assisted Living Home that has violated regulations according to the Nursing Home Care Act. When violations are identified, federal and state nursing home regulators can impose severe fines and penalties. The Illinois Department of Public Health (IDPH) conducts routine surveys and investigations on nursing homes to determine if any nursing home, rehabilitation center, or assisted living facility has violated regulations in the Nursing Home Care Act. Any serious violation of State and Federal regulations could result in severe penalties and fines. Please find the report for the Third Quarter here. By Illinois state law, nursing facilities must remain in compliance with care requirements as defined by Medicare, Medicaid, and the state. These Annual Surveys and Certification processes and unannounced investigations help determine if the facility has violated any one of the 180+ nursing home regulations enforced by federal and state law. When a deficiency is found, it must be promptly addressed and corrected. In some incidents, the facility will receive a fine for serious violations that are known to jeopardize the health and well-being of the resident or cause a severe injury or death. Please find the report for the Second Quarter here. Nursing facilities that are found guilty of numerous breaches of health code and misconduct that places patients at risk of harm are often classified as special focus facilities and monitored more closely to make sure that they change their policies. 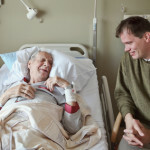 Unfortunately, the changes are usually short lived and the negligent nursing homes have a way of returning to their original habits the moment they escape the scrutiny of the government agencies keeping them in check. What must be done to finally secure the wellbeing of our loved ones and to hold nursing centers to account when their actions harm other people? It is seemingly impossible for state and federal health departments to keep tabs on every single nursing home in the United States. This can be shocking when you learn that 92% of nursing homes have committed some sort of infraction since opening their doors. Most of these deficiencies are minor and can be corrected with minimal effort. 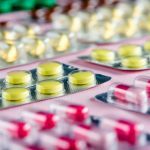 However, there is a growing number of systemic abuses that can be linked to the prioritization of profit over the needs and interests of patients. Please find the report for the First Quarter here. 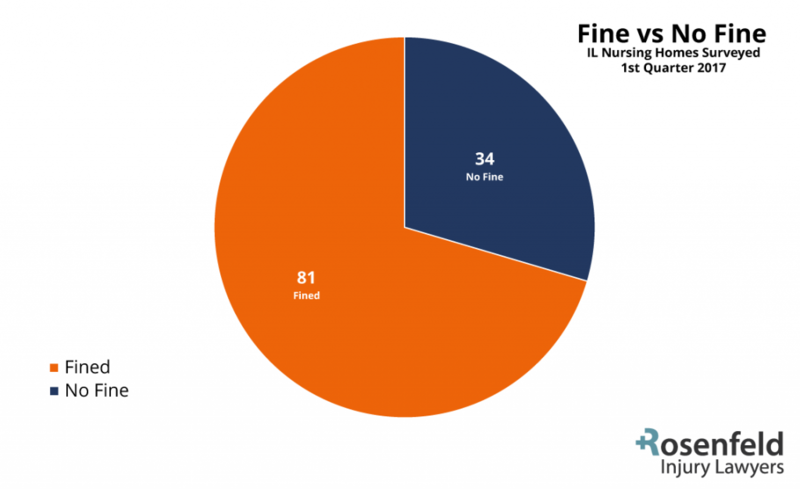 A representation of Illinois Nursing Homes fined vs those that were not fined.